How we perform an Annual Inspection separates us from most maintenance facilities. You may be asking yourself "How? Aren't all shops suppose to do an annual as prescribed in the F.A.R's?" 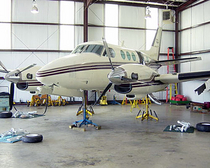 The answer is yes, but from our own personal experiences we have found that most shops will perform an annual inspection and automatically fix problems on their customers aircraft. When the customer comes to pick up their aircraft they get hit with a pretty large invoice. Sound familiar? We want you to first understand what airworthy item are and what they are not. First familiarize yourself with the 'Airworthiness Limitations" in your aircrafts maintenance manual (usually Chapter 4), if you have one. These items are airworthy items. Second and obviously, AD's and SB's that are associated with an AD. You will also have "Instructions For Continued Airworthiness" on the Airmframe, Engine, Propeller and many components on the Aircraft, including installed STC's. 91.411 and 91.413 Also known as Transponder, Encoder and Pitot Static Re-certifications. Lets also not forget that parts also have limitations of how far they can be worn down before they must be replaced. Next you need to understand the responsibilities of an owner. We are pretty sure you are already aware of these but we feel it is necessary to explain them. 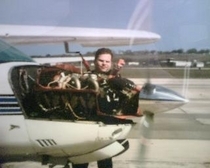 An owner is responsible for the Airworthiness of their aircraft, compliance of all A.D's and the aircraft's log books. A complete A.D. log should be included in your log books. It's the owner/operators responsibility to ensure the logs include a list of A.D's. It is also the owner/operators responsibility to ensure all A.D's are complied with. Please have this A/D log in your logs when taking your aircraft anywhere for an annual inspection. Most owners do not realize that an annual inspection is only an inspection. What this means is that an I.A. only has to inspect the aircraft. It by no means has to returned to the customer with an airworthy sign off, even though that is the goal of the owner. So, why do we tell you all of these things? We want you to be involved in the decision making process of your aircraft. We want you to know what your final bill is going to be. We want you to be able to afford to keep flying. 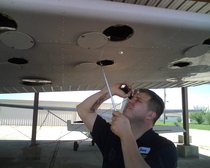 Blue Skies Aviation performs inspections with a common sense approach. Our inspections are broken down into stages. These stages are designed to keep you informed and allow you to budget how much you are spending on your aircraft. Stage 1: We receive the aircraft and fill out the inspection paperwork. We then look over the installed equipment and write down part numbers and serial number so that we can search for A.D's. We then make sure that all installed items comply with the aircrafts Type Certificate and if there are any STC's to explain otherwise. We then perform a Hot Compression check. We do all of these items first because if we find problems in these areas they could be expensive to correct. Why do a whole annual just to find out that you have a bad cylinder or that the engine the last owner installed is not the correct engine according to your Type Certificate and there is no STC for that engine in the logs? Stage 2: After the inspection is complete you will be given an estimate for all the items needing to be fixed. The airworthy items will be separated from the non airworthy items. This gives you the ability to keep your costs down and allow you to know what is wrong with your aircraft. After you decide what items to have fixed we will write another estimate that covers only the items you selected for repair. At this time we collect payment for the inspection phase (see "Inspections Fees" under the Maintenance tab to the left.) and for the parts that we need to order to repair the items you selected. Stage 3: We make all repairs you selected, wash the aircraft, receive payment for the completed work and deliver the aircraft. These stages have allowed us to become more productive and lower the maintenance cost to our customers. We hope you will find our way of performing your next annual more cost effictive and trustworthy of any of our competition.